I suspect everyone remembers stories about Nintendo games removing crosses and blood – or alcohol and smoking. I think it might be interesting to talk about the side effects of this. In the Japanese text, this line was something about drinking more booze. First of all, bars are pretty obvious. You tend to have dancers on platforms (who are sometimes translated as “singers,”) and a bartender behind the bar. Some games, like Grandia and Tecmo’s Secret of the Stars, change the wine to coffee. People “drunk” from coffee stagger around in the game. 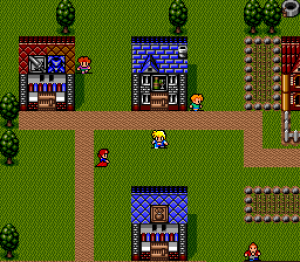 One sad thing is that the bars in Tecmo’s Secret of the Stars are places that are adult only and almost entirely depressing hovels. I know that showing alcohol was verboten, but it definitely wasn’t a positive display. In Japanese, the advisor is the priest. Religion is another one that gets changed. In Nintendo games, the crosses tend to be censored. 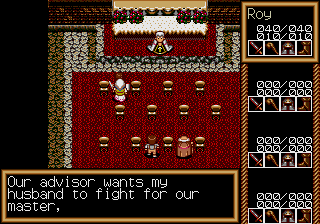 In Traysia, the crosses are left in on the church, but the priest is an “adviser” when a lady talks about him. Censoring the cross off of the priest in Dragon Quest IV gave them a chance to give him an extra animation (he blinks his eyes.) Usually, churches are blatently obvious in games. Without the crosses, it does make a it a little harder to find a church quickly. This is a typical sprite change in Tecmo's Secret of the Stars. This is a "coffee" shop in the US version. Death and violence is also censored. Sometimes, it’s just a literal translation. For example, using “knocked down” to mean killed. When blood gets through censorship, it tends to be more surprising. For example, there’s gore in the late game of Exile. There is a red river of blood from murderers washing their hands off in a sewer. Since there’s very little blood until that point, it’s more powerful than if you’d seen blood through the entire game. Unfortunately, sloppy coding can seem to indicate horrible massacres. 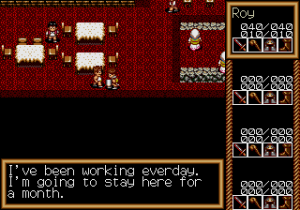 For example, let’s say you’re entering a castle, and there’s a lot of lying down guards. Without any text (or even with text,) it’s very easy to assume that all of them are dead instead of wounded. Unsurprisingly, this grape juice is actually white wine. It's also worth more than a ruby. I don’t think the game is more mature when there’s wine instead of grape juice. However, I think that death, religion, and iffy subjects that can be treated with finesse and care. Since early games tended to be less censored the farther you got into them, the censorship often didn’t effect the later game as much as the early game. So the late game drama was pretty close to the intended drama. I think Exile is a good example. 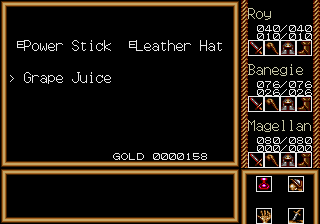 In Exile, all your “healing” items are hard drugs. In the earlier games of the series, Sadler could kill himself with overdoses. In Exile, they don’t really matter statistically. In the Japanese version, Sadler smokes at all times. In the US version, the cigarette is censored out. A smoking soldier weary of war and running on a half a dozen drugs is different from the Sadler in the US game, but I’m not sure that he’s a “better” character.